It can’t be denied that insects, though not a popular topic of conversation in most cases, are becoming increasingly more popular in various aspects of our (not so) daily life. Although usually brought up in conversations as a new source of protein, Hubert Duprat saw a more aesthetic purpose for this crawly creatures. I first got in contact with Duprats work at the exposition of international fashion designer Dries Van Noten at the MOMU in Antwerp. Dries shows all his art, fashion, music and other inspirations in relation with his collections and Duprat was one of them. I was really intrigued and started some research on this artist’s work. 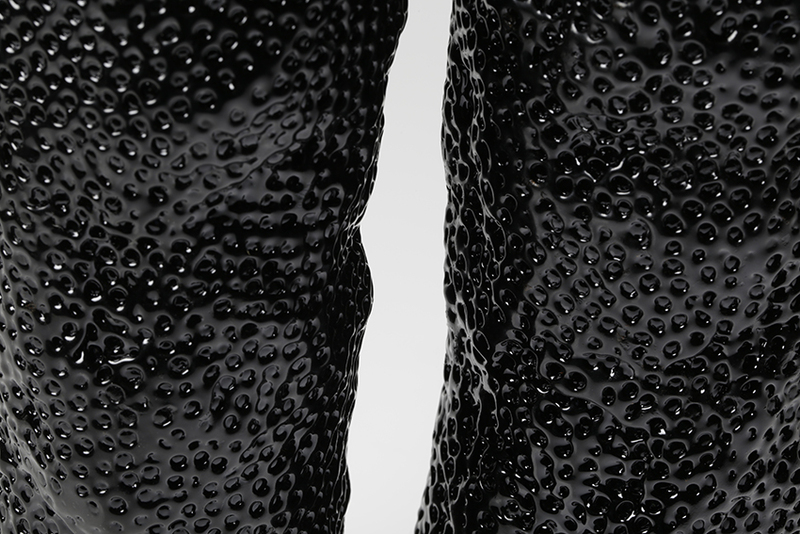 Duprat’s art is currently being showcased at the 56th Art Biennale in Venice. 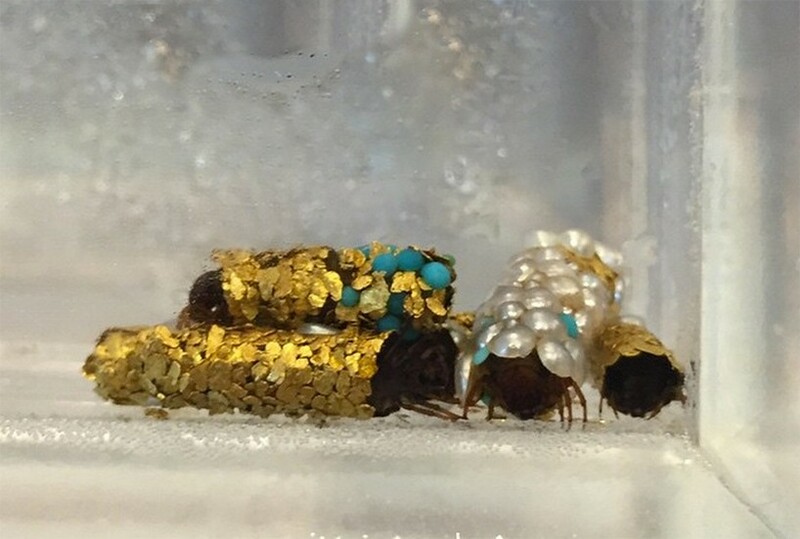 His unique nature meets art projects are collaboration between the caddis fly larvae and the artist who provides them with precious stones and metals. Caddishly larvae are known for their underwater architecture skills, as they spin cases or cocoons using silk excreted fro their salivary glands. Usually these cocoons are made out of whatever materials the larvae can find in their natural habitat, such as sand, small pieces of wood or aquatic plants. Duprat was intrigued by the caddis fly larvae ‘s craftsmanship and decided to see what would happen if he provided them with other materials. As the saying goes, the rest is history. 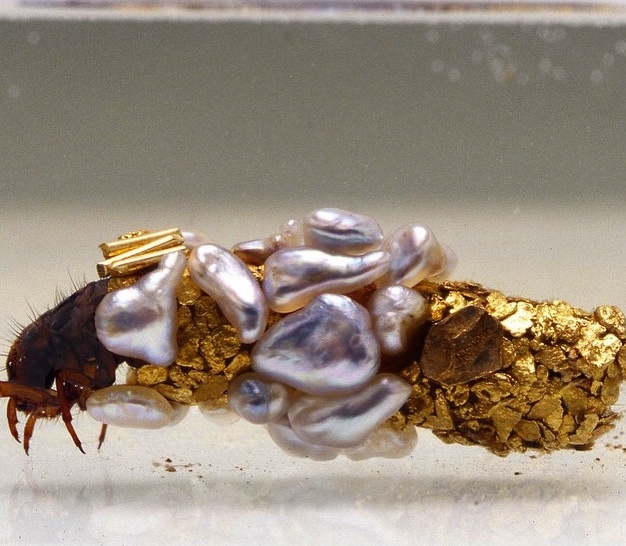 Duprat started working with caddis fly larvae in 1980, where he would gently remove the natural cases from the larvae and place them in tanks filled with gold flakes. The larvae would then begin to spin new protective cases made from silk and gold. Throughout the years Duprat experimented with other materials than gold as well, like precious stones such as sapphires, pearls, rubies, coral, turquoise and even diamonds. Nature connects with art in the purest form. Magical. Duprat isn’t the only artist who turns to insects for inspiration. Marlène Huissoud, a designer who comes from a family of beekeepers, successfully found a way to turn insects and their waste streams into future craft artifacts. One of the materials Huissoud uses is propolis, also known as bee glue. It’s a mixture that bees collect from tree buds and sap flows and used as a sealant for unwanted open spaces in the hive. 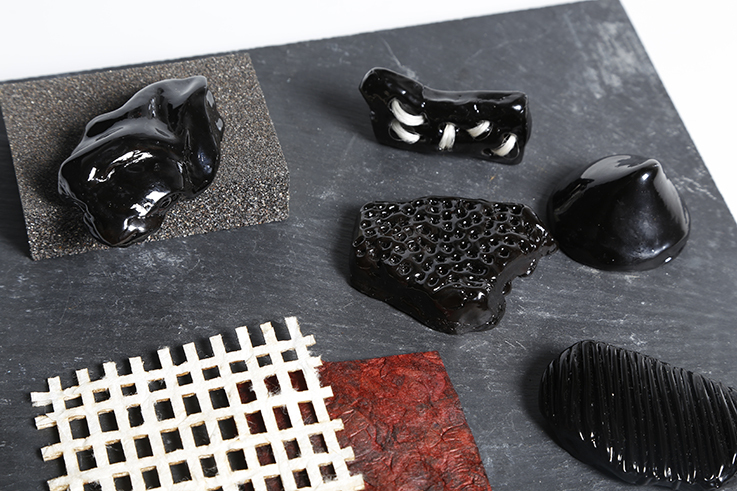 The most common color for propolis is brown, but Marlène used the black variant from rubber trees for her work. 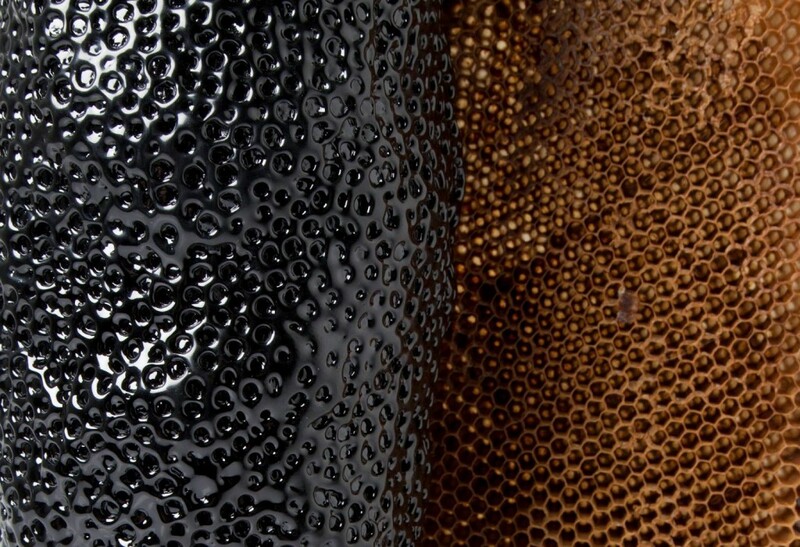 She used traditional glass blowing and engraving techniques, as propolis reacts similar. 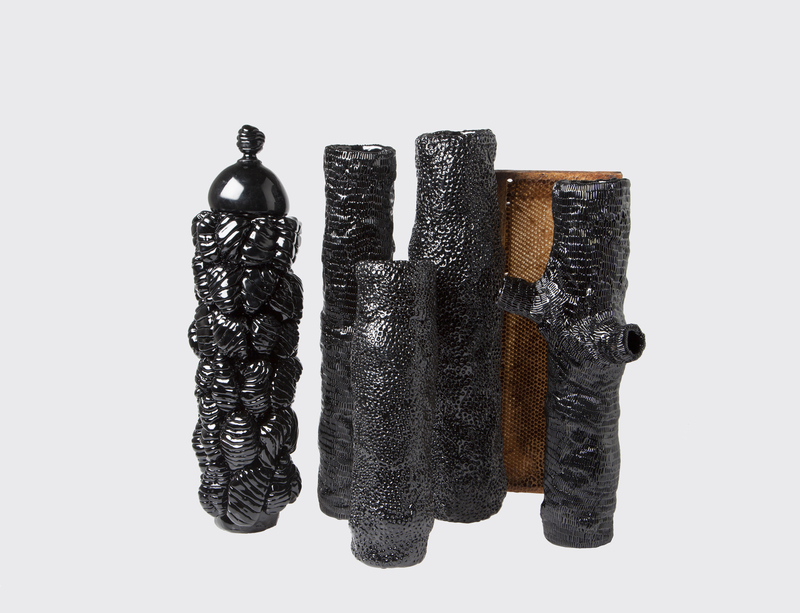 Huissoud then created artifacts that look like tree trunks, each engraved with a different pattern. I love these kind of projects where artists show us how we can co-exist in close collaboration with nature, not by taking away all it’s resources but using natures amazing techniques to create something new. Insects and their by products can be used for so many different purposes and it’s more than likely we’ll see a lot more of these beautiful art and/or objects in the years to come. I can’t wait to visit the Art Biennale in Venice in September to see Duprat’s work for myself. I’ll bring extra pictures and stories, so keep an eye on the blog in the next coming weeks for more! All images courtesy Duprat and Huissoud. Previous PostTried & enjoyed: Volta Popcorn, a restaurant popped up in a cornfield. Next PostTried & enjoyed, Restaurant Café Modern Amsterdam.